New York Department of Environmental Conservation (DEC) announced today that they have finalized water withdrawal regulations. These regulations limit water withdrawals greater than 100,000 gallons per day, and expand the permitting program to include withdrawals for purposes including commercial, manufacturing and industrial activities. The regulations go into effect April 13, 2013 with the first set of permit applications to be due on June 1. The regulations are being issued now so businesses will have adequate time to comply, the agency told the press in a release. They promise that DEC will collaborate with stakeholders on implementation of the regulations, and will provide outreach to guide applicants. 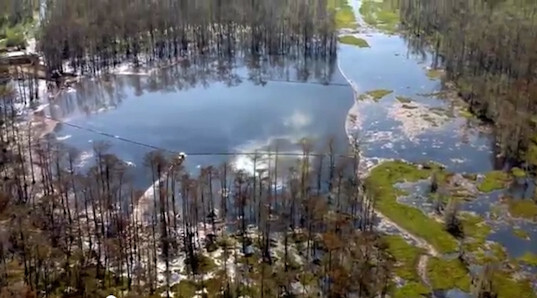 The sinkhole in Assumption Parish, LA just keeps growing. Now it’s about the size of six football fields- at least that’s the best estimate from the local police who took aerial photos at the beginning of the month. The sinkhole formed when a salt dome (owned by Texas Brine) collapsed this summer. Recent earthquakes have contributed to further collapse. People living above the salt dome say they feel like they are “walking on jello”, and the USGS reported an average of a tremor a day earlier this month. Now there are new concerns about rising concentrations of poisonous gas. Workers found high concentrations of hydrogen sulfide at a Texas Brine well near the sinkhole – they’re flaring these wells in an attempt to get rid of the gases in the salt dome. No high levels of the gas has been found in the community, yet, but state officials and Texas Brine representatives are monitoring the gas. Unlike methane, hydrogen sulfide is heavier than air, and collects near ground level. According to the Agency for Toxic Substances & Disease Registry (ATSDR), even brief exposures to high concentrations of hydrogen sulfide (greater than 500 parts per million) can cause loss of consciousness and possibly death. In many individuals, there may be permanent or long-term effects such as headaches, poor attention span, poor memory, and poor motor function. Some residents living near the evacuation zone have reported foul odors and symptoms that reflect gas poisoning. But they have not received help with evacuation. “… The purpose of the leases is to explore, drill, produce, and otherwise operate for oil and gas and their constituents.” And the fact that New York State is still reviewing regulations for high volume horizontal hydraulic fracturing (HVHF) does not stop oil and gas companies from exploring, drilling, producing and otherwise operating, says Hurd. Even though the state does not allow fracking, “… drilling permits for conventional drilling methods have, and continue to be, issued in the area of plaintiffs’ lands,” wrote Hurd. He clarified that the leases signed by landowners did not limit Chesapeake’s right to drill to a specific type of drilling or a particular formation. The whole force majeure argument was based on the illusion that the state was preventing the gas companies from drilling. 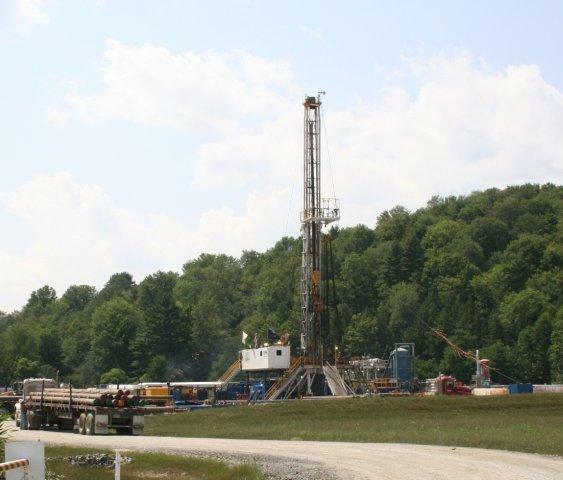 But, notes Hurd, “While defendants submit evidence demonstrating that horizontal drilling combined with HVHF is the only commercially viable method of production in the Marcellus Shale and drilling using conventional methods is impractical,"[m]ere impracticality . . . is not enough to excuse performance." The gas companies “…contracted for access, exploration, and the right to drill for a set period of time.” Not for a specific technique or formation. This decision brings a sigh of relief to more than 50 landowners in Broome and Tioga counties who were trapped in leases that should have expired years ago. You can read Judge Hurd's decision here. Read previous posts about the force majeure cases here. (1) That DEP report all data from households where well water was sampled due to suspected pollution from gas and oil operations. A court deposition of the technical director of DEP's Bureau of Laboratories indicated that DEP routinely omits data on 16 of 24 heavy metals for which it conducts water analyses from the final reports provided to well owners. 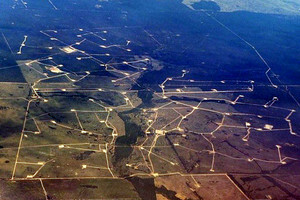 Some of the omitted metals have serious health impacts and have been found in drilling flowback and produced water. DEP should revise its testing protocol to include all potential contaminants so the agency can accurately evaluate drinking water impacts and affected residents can make informed decisions about their water supplies. (2) That DEP revoke the new policy requiring administrators in Harrisburg to approve any positive notices of water contamination before public notification is made. In response to previously made requests in this regard, Secretary Krancer claimed DEP was fully transparent. 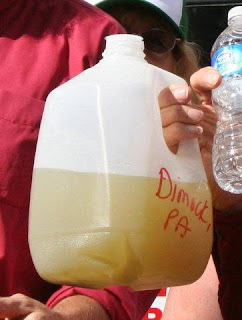 In light of the revelations of Kiskadden vs. PADEP, the groups reasoned that the data used by DEP and provided to the public is neither complete nor accurate, and should not be the basis of determining whether pollution has occurred. Notification of contaminated water should be made without delay and bureaucratic red tape eliminated due to the potential harmful health impacts on residents waiting for testing results. (3) That the missing results from all well water tests ordered by the DEP should be provided immediately to well owners. This includes all tests using special reporting codes that omit from reports data that is necessary for accurate determinations by DEP of whether pollution occurred and whether residents’ health and water supplies are being harmed. Determinations by DEP based on partial data must be questioned. “One the biggest fears for people living near drilling is the possibility of having your drinking water supply impacted,” says Steve Hvozdovich, Marcellus Shale Policy Associate with Clean Water Action. People trust the DEP to safeguard the public, but DEP’s policies and actions have eroded that trust. You can read a copy of their letter here. 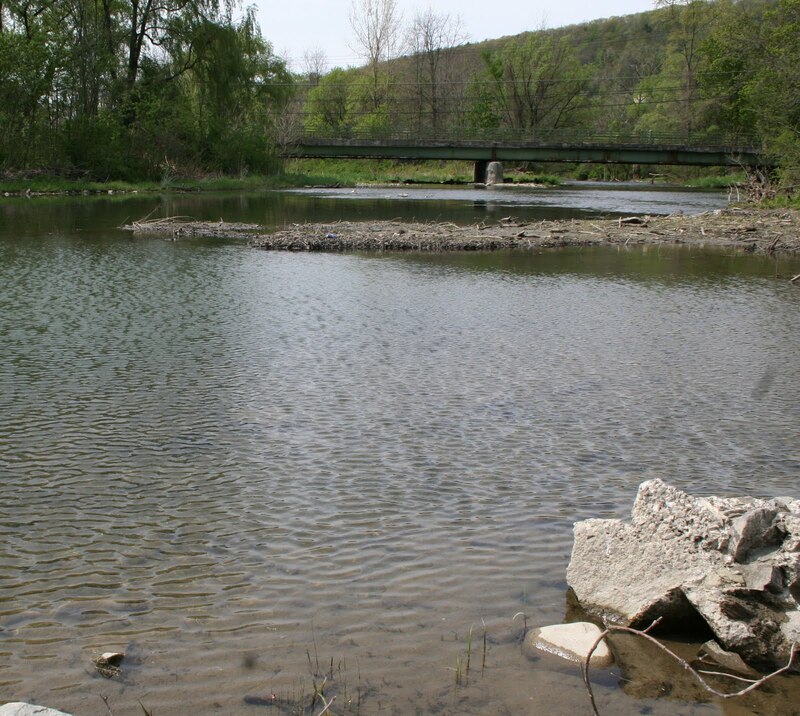 Read more about the problems with DEP’s water quality testing here.